My quest for beautiful witchy boxes continues! Today I’m sharing up close what we received in The Witches Bounty subscription box for March 2018. These are the same people who put together The Witches Moon box which I love so much. Both of these boxes are definitely made for the person who is actively practicing their spiritual craft while still not intimidating for a beginner. I point this out because a lot of witchy boxes are more “mainstream” if you will. 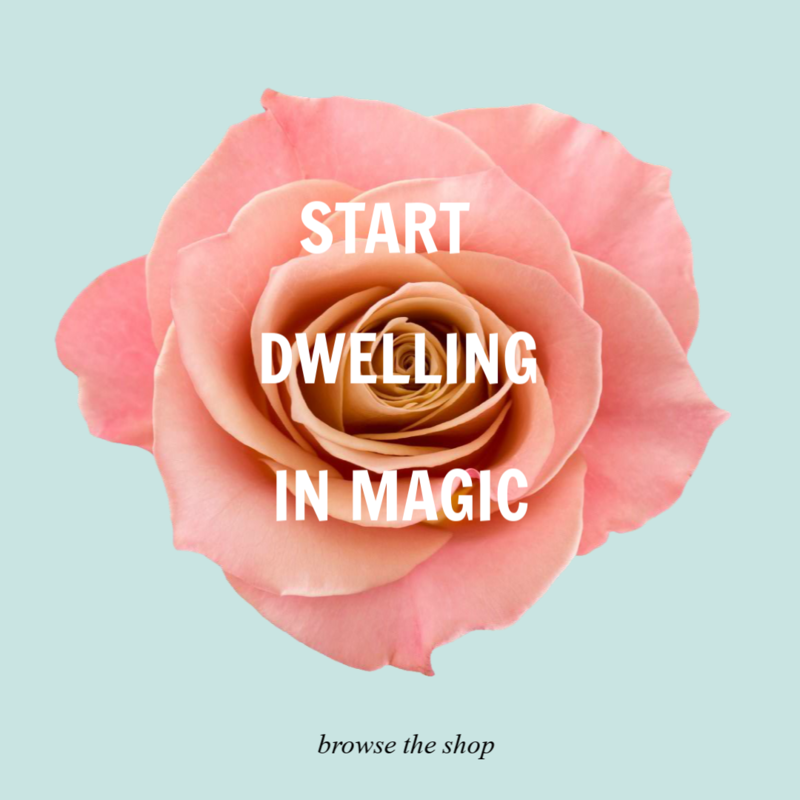 If you’re a practicing witch looking for genuine tools to inspire and help you grow every month, you’ll definitely want to check out The Witches Moon and The Witches Bounty, which I linked above. 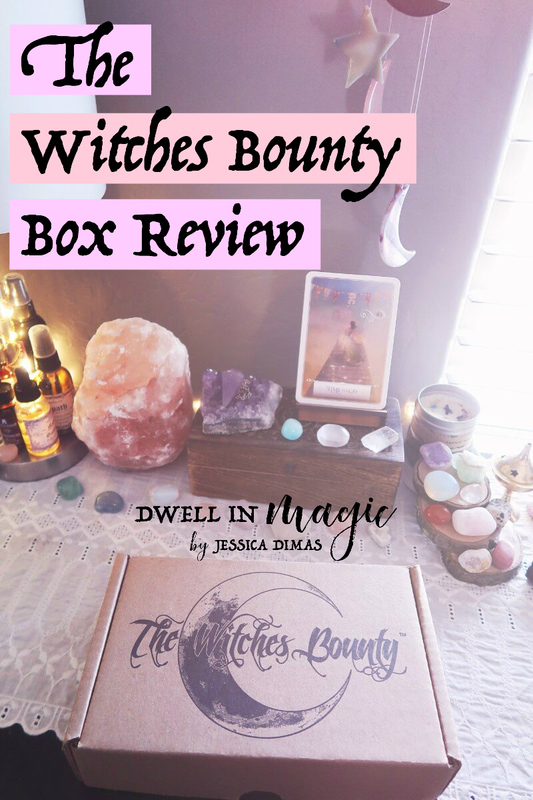 The Witches Bounty, the box I’m reviewing in this post, is a high quality, metaphysical jewelry subscription box. 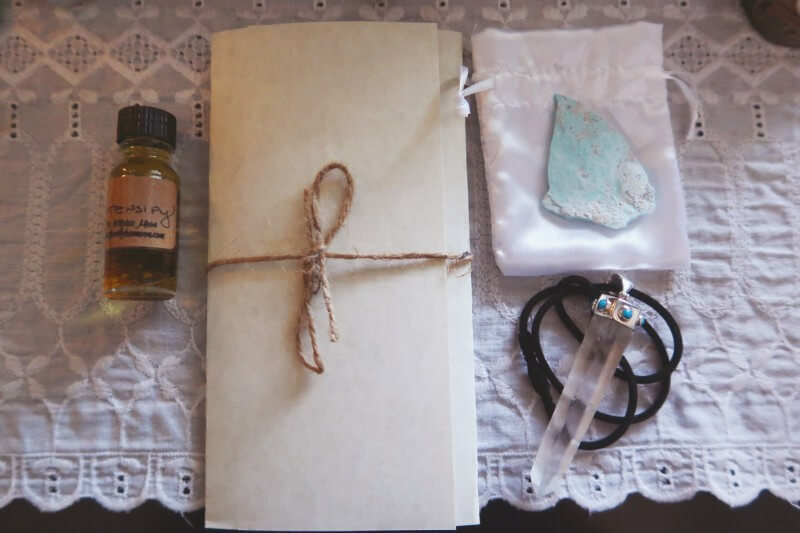 Every month it comes with a one-of-a-kind pendant from Sedona, a hand created anointing oil and a crystal that correlates with the pendant and oil. And if you’re wondering the difference between their two boxes, The Witches Moon is a premium subscription box for witches that comes with 10-20 items every month that keeps your tools stocked. You can read my review here for that box to see what comes in it. 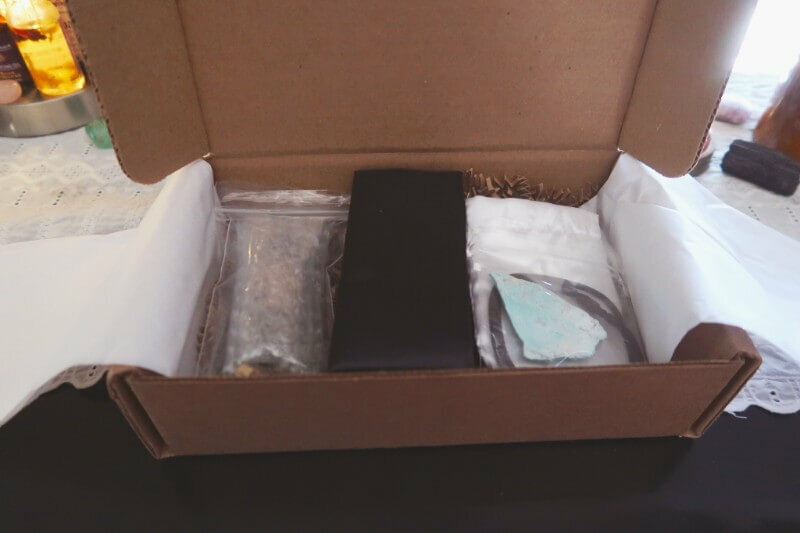 This focused box has less items than your standard box and a higher price point, but if you’re looking to grow a high quality collection of specialty metaphysical jewelry, this box will provide you with that. 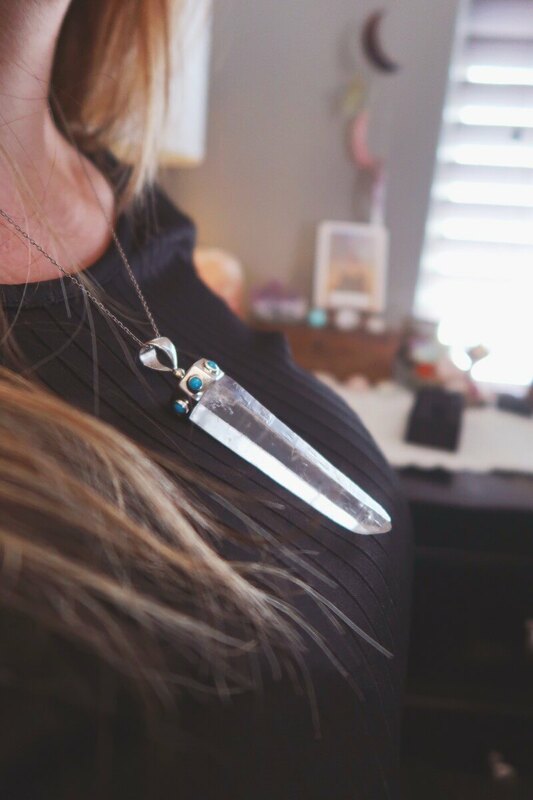 I like that in addition to the unique piece of jewelry they send every month, they send an oil and crystal that works with the energy of your new jewelry. When I first opened the box, I didn’t notice the black, stretchy necklace cord that is to be used with this pendant, so I put this on my own chain. In the last photo of this post you can see a picture of the soft cord that comes with the pendant to use if you don’t have a chain. I tried taking several photos of this gorgeous quartz wand so that you can see the size of it. I’m guessing it’s around 3 inches and it’s pretty hefty. “This stunning pendant has been cast into a one of a kind mold using .925 silver. We have worked with the curators of our pendants to create an exclusive piece that is only offered through The Witches Bounty. The Laser Quartz has been a very beneficial tool in our craft, not only for healing work, but for amplifying the energy around us. 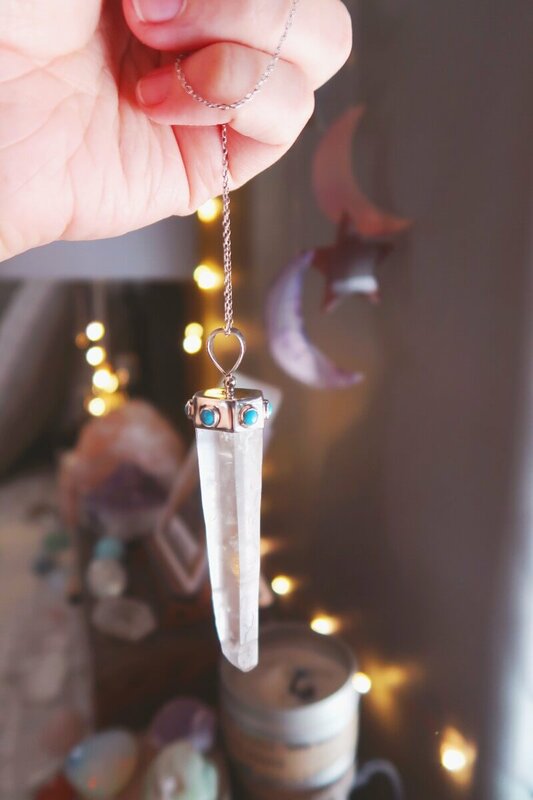 As this wand is also a clear quartz, it easily absorbs energy that can be directed through the point of the crystal. Laser quartz has also proven to be a great energy releaser, allowing you to cut ties from those things that no longer serve you. 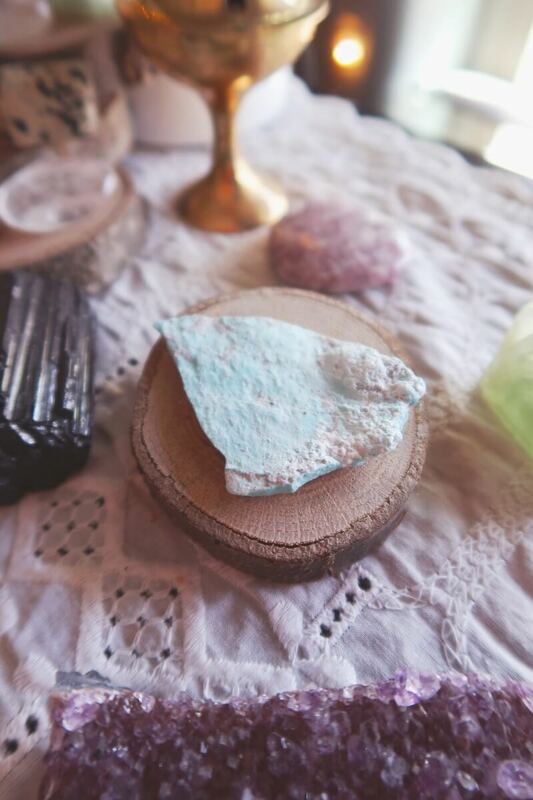 We have included a small inlay of Campitos Turquoise to facilitate the release of anxiety, depression and worry, replacing these energies with luck, success, ambition and creativity. 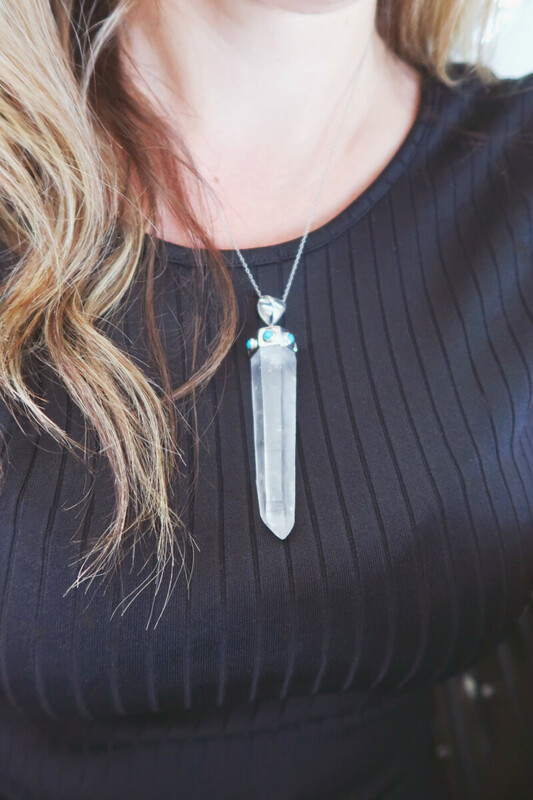 Spiritual: As a protector, laser quartz is a great wand to cast a circle of protection around your aura. Allow the white light to consume the energy around you. 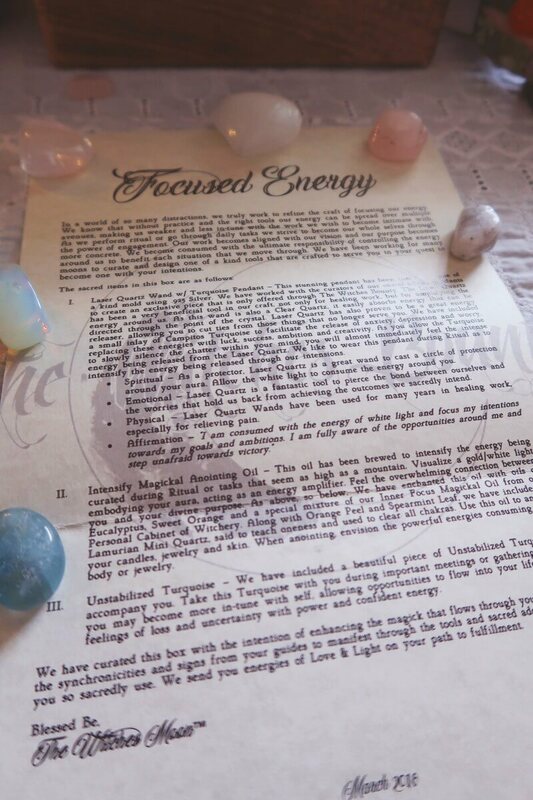 Emotional: Laser quartz is a fantastic tool to pierce the bond between ourselves and the worries that hold us back from achieving the outcomes we sacredly intend. 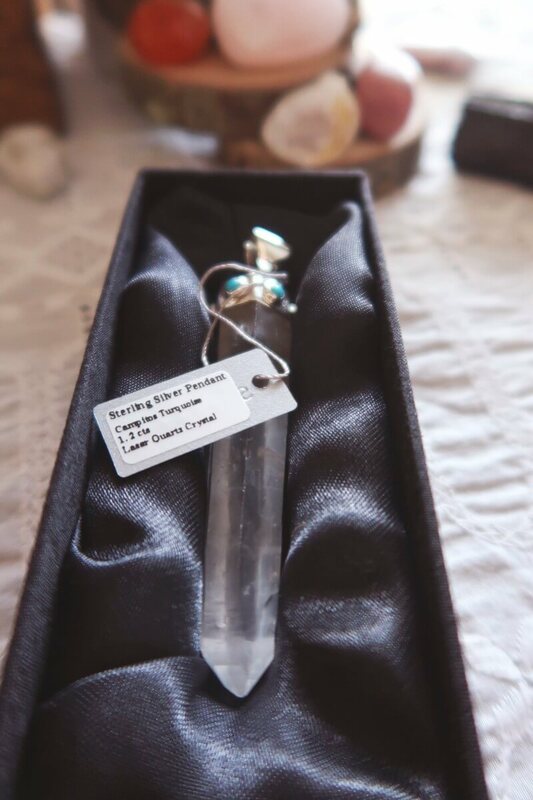 Physical: Laser quartz wands have been used for many years in healing work, especially for relieving pain. Affirmation: I am consumed with the energy of white light and focus my intentions towards my goals and ambitions. I am fully aware of the opportunities around me and step unafraid towards victory. 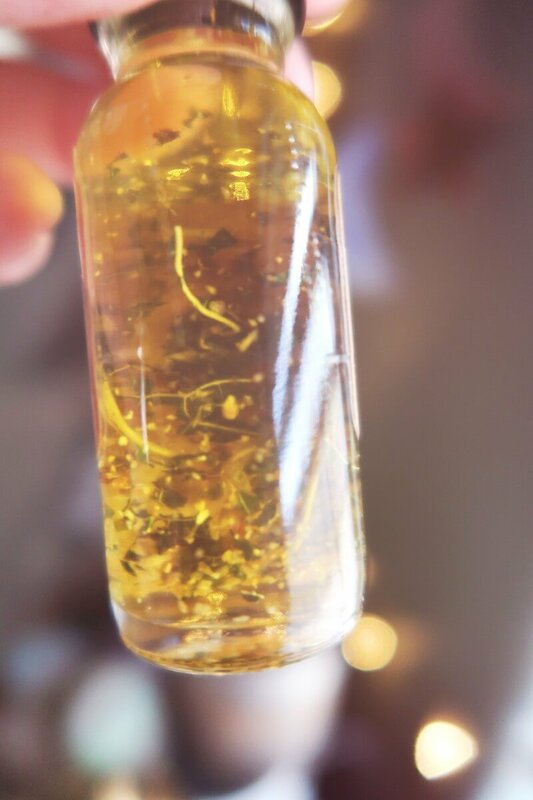 I love using anointing oils and use them every time I do a ritual or practice any form of divination. The energy they carry is usually specific depending on which oil you use but always vibration lifting for me. “This oil has been brewed to intensify the energy being curated during ritual or tasks that seem as high as a mountain. Visualize a gold/white light embodying your aura, acting as an energy amplifier. Feel the overwhelming connection between you and your divine purpose. As above, so below. 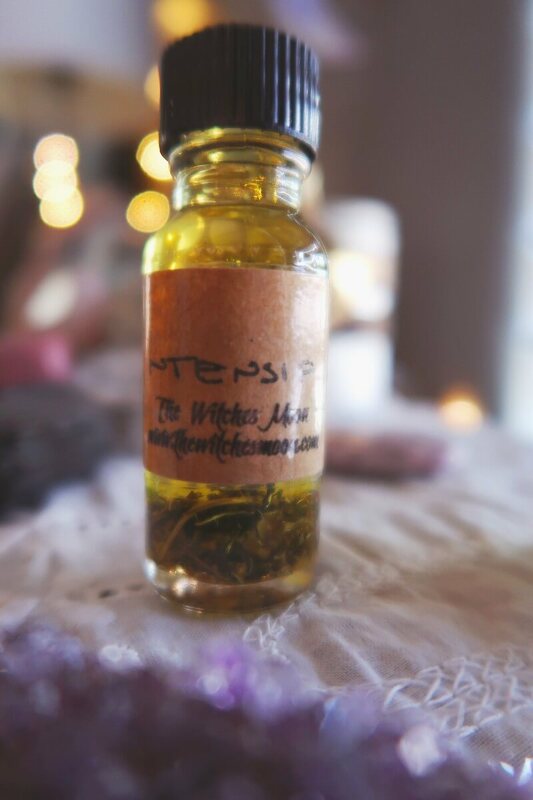 We have enchanted this oil with oils of Eucalyptus, Sweet Orange and a special mixture of our Inner Focus Magickal Oil from our Personal Cabinet of Witchery. 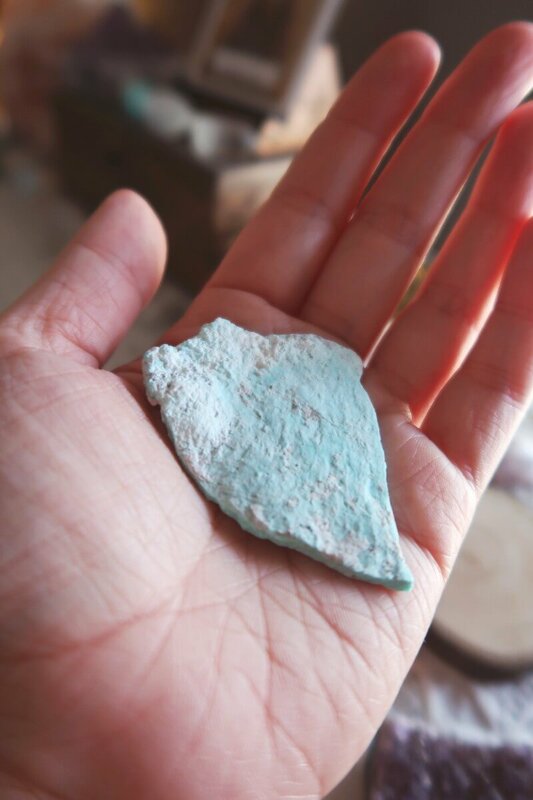 The last thing in our box was this beautiful, light blue unstabilized piece of turquoise. It has such a unique and soft feel to it, not to mention I’m in love with the color. I love turquoise because it’s a great stone for warding off depression, helping you to communicate yourself, protects against negativity, and brings an inner calmness. It’s also a highly spiritual stone and helps to balance and align your chakras. Click here to check out The Witches Bounty page. I hope you enjoyed checking out this box and everything we received this month. Have you tried this box before and if so, what were your thoughts? I’d love to know in the comments below!